Whenever something went wrong in television production, the cry was always "We'll fix it in post". Except that there was rarely enough time, in a broadcast schedule, to fix anything. Today we expect every programme - even routine television programmes like daily dramas - to look and sound perfect. But we still do not have enough time to correct everything in post. The only answer is to find a better way of working. Two technological advances have brought about an improved workflow. First, as we all know, content is now stored, manipulated and managed as digital files rather than a linear stream. We can move content around more simply and often more quickly, and we don't have to transfer a huge batch of content when all we want is a single shot. Second, the continuing rise in raw processing power means we can do more things to a picture in real time than ever before. That means we do not need to wait for anything to render: our standard hardware will show us our edits, transitions, effects and colour grades at the moment of replay. The obvious benefit of real-time playback is the saving in render time, but there is a more subtle point. It means everything we do is non-destructive. We are not "baking in" anything, and we can reverse out with limitless levels of undo if we need to. That, in turn, means we no longer need to ship large quantities of content around - we just need the raw material. After that, all we are doing is building sets of metadata that tell the processors what to do with that raw material: edit decision lists, colour decision lists and so on. That makes moving jobs from room to room quicker, too. All of these advantages make for a faster, more reliable and more creative workflow. At FilmLight we achieve this seamless, render-free workflow by matching our Baselight grading systems with Baselight Editions, which are plugins for popular software: Apple FCP and Avid editors and NUKE visual effects, with more to be added in future. The plugins achieve two things. First, if there is colour grading information in the metadata that arrives with the content then they impose it. That means editors get to see graded shots as soon as the colourist releases them. One advantage, which is not obvious but makes life much better for busy producers and directors, is that they can look into the colour suite and see how the grade is going. Then they can walk next door into the dubbing suite and not be surprised by the pictures: the audio room can have the same plugin, so will see exactly the same graded images. It sounds like a luxury but in practice it saves time and frustrations. 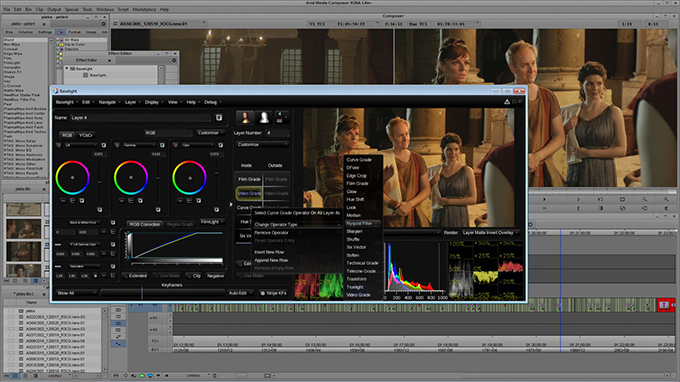 The second thing that Baselight Editions do is to put the Baselight grading toolset into the host software. If, say, an editor needs to make a small adjustment to the grade to make a transition look right, the whole sequence does not have to go off to wait for the colourist - the editor can make the adjustment in moments. Remember that all the editor is doing is updating the metadata. This is a non-destructive change. The colourist can roll back, or finesse it still further, if they need to. It will be easier to appreciate the benefits of this render-free workflow if we look at a real example. Coronation Street is the longest-running continuing drama in the world, first broadcast in 1960 and a popular feature of the UK's television scene ever since. Currently it is broadcast five nights a week, so the producers are effectively making a full-length movie every week, not counting the additional online content. At the beginning of 2014 ITV Studios, the makers of Coronation Street, moved it to a new home, with four studios as well as a carefully reconstructed - and subtly improved - outdoor lot. The move also allowed the producers to upgrade its post technology and workflows. Editing is on Avid, with dubbing and track-laying on Pro Tools. 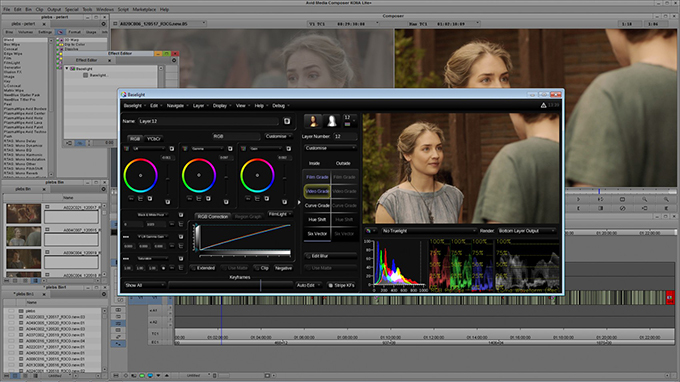 All are connected to a core Avid ISIS shared storage system, along with the Baselight ONE grading system. The Avid stations - including those used to display pictures in the sound rooms - each have the Baselight for Avid plugin installed. While colourists and editors can work in parallel, in practice a first cut of the programme is made before the colourist starts to work. In general the look of the show is warm and welcoming, although steelier looks are sometimes used for dramatic emphasis. Outdoor scenes often need matching, given the changeable nature of the weather in Salford. The colourist picks up the AAF edit file and sees the content on the ISIS. As the grade is worked on, more information is added to the AAF file. When the programme is opened again in Avid - for more work, for finishing or for viewing - Baselight for Avid interprets the grading information, including shapes, tracking information and keyframes, and gives each shot the same look that the colourist created. No render is required, and a full, complex grade is applied in a matter of seconds. If the producer wants to extend a shot or trim something, there is no need to regrade as the colour information follows the edit. If a director wants to tweak the grade, the finishing editor can do it through Baselight for Avid: the finishing suite has its own Slate control panel, which is a smaller footprint version of the Blackboard panel in the grading suite, but with the same high-quality controls. An episode can be completed - edited, graded, dubbed, finished and signed off by the producer - without a single render having taken place. All the post information is metadata, imposed as effects in real time. The only time you need to flatten the file is at the point of delivery. Over the course of each episode this workflow saves hours in terms of processing and moving large files around. That makes a huge difference when you are working on television timescales and budgets. And at the same time as making savings, it also improves quality by making the decision-making fluid. 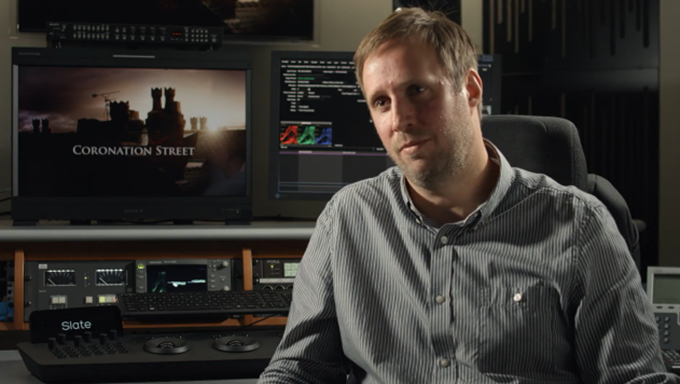 Collaborative post-production has been something of a buzzword at the top end in recent years. What broadcast production facilities like ITV Studios have discovered is that there are real benefits in applying the same principles to television. Even under the pressure of very tight timescales, you can still boost the quality and control the budget by applying smart technology.